Be transported back in time on this full-day, private tour of the ancient city of Cordoba that includes round-trip train travel from Madrid. Discover the awe-inspiring Cordoba Mezquita (cathedral-mosque), wander through the streets of the ancient Jewish quarter and visit one of Spain’s last remaining medieval synagogues on this comprehensive all-day sightseeing tour with an expert guide. This private tour ensures you’ll see the best of Cordoba while receiving undivided attention from a personal guide. Make your own way from Madrid to Cordoba by AVE, a high-speed rail service that translates quite aptly as ‘Spanish High Speed.’ On arrival at Cordoba, meet your expert guide at the central train station and start your 3-hour tour of the city. With its heady mix of Roman, Jewish, Christian and Moorish influences, Cordoba is one of Andalusia’s most fascinating cities, and is the perfect place to lose yourself for the day as you wander through the alley-thin streets, exploring the whitewashed courtyards, churches and other attractions. 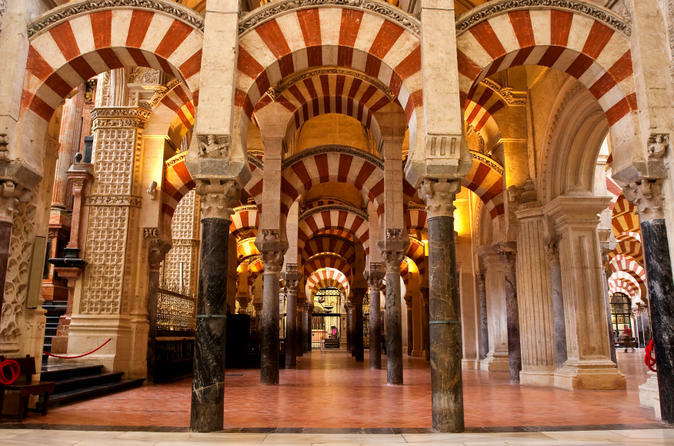 Follow your guide as you walk toward your first stop of the tour, Cordoba Mezquita. Dating back to the 8th century, the Mezquita was a medieval Islamic mosque before it was converted into a Christian cathedral. From the intricately patterned ceilings to the red-and-white-striped archways, marvel at the incredible architectural details as your guide takes you on a tour of the great mosque. Next, visit the Jewish quarter, a maze of winding cobblestone pathways, squares and quaint buildings. Be transported back in time to the era of the Romans and Goths as you stroll through the charming streets toward your next stop, Cordoba’s 14th-century synagogue. One of only a few medieval synagogues remaining in Spain, the synagogue sits in the heart of the city’s UNESCO-listed Old Town. After exploring the synagogue, head back onto the streets with your guide to visit the Calleja de las Flores. One of the most popular attractions in Cordoba, Calleja de las Flores is a tiny alley that opens into a square and is famous for its collection of flower pots that are fixed to the walls. Your tour ends back at Cordoba’s central train station, leaving you perfectly placed to board your high-speed train back to Madrid independently. Please note: Guide will be available for 3 hours during the tour.